Google translation from russia. Rearranged by Maribeth Barber. Swedish businessman and diplomat Raoul Gustav Wallenberg was born on August 4, 1912 to one of the wealthiest families in Sweden. He studied at the University of Michigan (USA), where he received his diploma in architecture. In 1936 he went to work in Haifa (then part of Palestine). He returned to Sweden in 1939 and became a partner in Kalman Lauer’s Hungarian export-import firm. In the summer of 1944, as the first secretary of the Swedish Mission, Wallenberg went to Budapest. Hungary, in March 1944, had been invaded by German troops. Taking advantage of his diplomatic immunity, Wallenberg saved, according to various sources, from 20 to 100 thousand Jews by issuing them Swedish passports. He placed them in specially purchased houses that were proclaimed as Swedish property, and thus were protected by international law. He also bribed German and Hungarian officials, promising ample supplies in exchange for Jewish lives. On January 13, 1945, Wallenberg was arrested by the Soviet patrol in the International Red Cross building in Budapest. (In another version of the story, he came to the location of the 151st Infantry Division and asked for a meeting with the Soviet command. According to a third account, he was arrested at his apartment.) After being questioned, he was sent under guard to Debrecen for a meeting with the commander of the Second Ukrainian Front, Rodion Malinovsky, who wanted to speak with him. On the road he was again detained and arrested by military intelligence (in another account, he was sent to the headquarters of a group of Soviet troops after being arrested in his apartment). 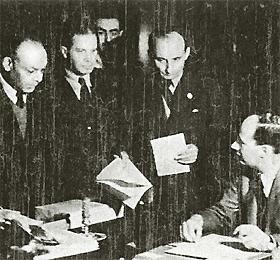 After several requests from Sweden, the Soviet Foreign Ministry informed the Swedish ambassador in Moscow in January 1947 that their search for Wallenberg had not produced results. In August 1947, the Foreign Ministry informed Sweden that Soviet authorities had no knowledge of Wallenberg’s whereabouts. In 1957 the Soviet government officially acknowledged Wallenberg’s arrest and imprisonment in the Soviet Union. In Andrei Gromyko’s memorandum, it was stated that the diplomat had died in the MGB’s inner prison on July 17, 1947, of a myocardial infarction. In 1991 a joint Russo-Swedish Working Group was formed to establish the circumstances of Wallenberg’s death. Its mandate was to identify documents about Raoul Wallenberg and was finished in 2001. The Russian side concluded that, firstly, all the circumstantial evidence confirms that Raoul Wallenberg likely died on July 17, 1947; secondly, that the responsibility for Raoul Wallenberg’s death lay with what was then the highest state leadership of the USSR. In December 2000, the Prosecutor General of Russia decided on the rehabilitation of Raoul Wallenberg. The Prosecutor’s Office declared that it had been repressed by Soviet authorities for political reasons. In September 2007, the FSB handed copies of the documents from Wallenberg’s case to Russia’s chief rabbi Berel Lazar, as the first public contribution to the Museum of Tolerance. According to some accounts, Wallenberg may have been alive in 1989. He was reportedly detained in prison and psychiatric hospitals in the Soviet Union, particularly in the Moscow region, where he was allegedly seen in 1951, 1959, and 1975.